My thanks to all of you who kept myself and our pilgrims to France in your prayers over the last two weeks. As we return to St. Landry, my hope is that we will bring with us a renewed spirit of devotion to our patron and to the heritage of our French spirituality, which is so richly illustrated in the depictions of French saints and devotions in the stained glass windows and statues in our church. My personal thanks to all those who helped defray the cost of my trip, especially the Doucet Family, who made a generous donation for it in memory of their beloved sister, Cecilia, who recently passed to the next life. Please keep Cecilia and the family in your prayers. A busy Spring continues in the upcoming weeks here at St. Landry. Next weekend we will celebrate Mother's Day, a day we celebrate to express our appreciation of mothers and the important work that they do. Prior to Mother's Day, more than 40 mothers will participate in a women's retreat at Our Lady of the Oaks Retreat House in Grand Coteau. Please keep these women in your prayers for a fruitful retreat and renewed spirit in their motherly vocation. The following weekend, May 19, we have rescheduled our Easter Picnic. Please mark your calendars to join us after the 10am Mass on the parish grounds for food, fun and fraternity for all ages as our parish celebrates the gift of The Resurrection given to us during the Easter Season. Please also pray for good weather! Finally, please also make plans to celebrate the 50th anniversary of Monsignor Melancon's ordination to the priesthood on May 26 at the 10am Mass, followed by a reception at the Opelousas Catholic cafeteria. Both he and Monsignor Metrejean celebrate their 50th jubilee's this year, and we want to thank them for their service to the Church, especially their service to our Opelousas community. Msgr. Metrejean will have a celebratory Mass at Our Lady Queen of Angels on Friday, May 24 at 6pm followed by a reception in the parish hall. All are invited to participate in these celebrations. If you plan to attend Msgr. Metrejean's jubilee Mass and reception, please RSVP to Elaine Dartez at 942-5628 by May 15. The bulletin for the week of May 05, 2013 has been posted. Click here to see it. The current week's homily is available on a link on the front page of the website next to the link for the current week's bulletin. On the page with the prior bulletins, the corresponding homily will be sitting side by side with its bulletin. We started on the anniversary of the start of the Catholic Church, Pentecost Sunday --- nearly four years ago. This week, the Fifth Sunday of Easter, is our two hundred sixtieth!! podcast to be posted. The homily is given by Monsignor Louis Melancon. If all is going well on our pilgrimage to France by Sunday, we will have visited the village of Lourdes, home of St. Bernadette Soubirous, to whom our Blessed Mother appeared some 18 times in 1858. Both St. Bernadette and Our Blessed Mother are depicted in the large stained glass window in the south wing of the church. We will have also viewed her incorrupt body at Nevers. We then will have visited the village of Ars, where St. John Vianney ("The Cure of Ars") was pastor from 1818 to 1859. His incorrupt body is interred in the basilica there. The basilica, for the most part, was constructed under his pastorate in this tiny village. He is the patron saint of parish priests, and his statue is located in the south wing of the church. After Ars, we will have travelled to Paray le-Monial, where Jesus appeared to St. Magaret Mary Alocquet in 1675 and asked that First Fridays be devoted to His Sacred Heart. This apparition is depicted in the large stained glass window in the north wing of the church. This week we will visit Chartres to tour one of the most beautiful and best preserved cathedrals in the world, built in 1195. We will then travel to Paris where we will visit sites that depict or were founded by our patron, St. Landry. Besides other secular places of interest, we hope to make a trip to Lisieux, home of St. Therese, who is depicted in a statue in the north wing of the church, as well as the Sacra Coeur (Sacred Heart) Basilica. Please be sure to keep our group in your prayers for a safe return home, and know that we are keeping you in our prayers as we visit these holy places. May these holy saints continue to inspire all of us to imitate Jesus in our daily lives! The bulletin for the week of April 28, 2013 has been posted. Click here to see it. The current week's homily is available on a link on the front page of the website next to the link for the current week's bulletin. On the page with the prior bulletins, the corresponding homily will be sitting side by side with its bulletin. We started on the anniversary of the start of the Catholic Church, Pentecost Sunday --- nearly four years ago. This week, the Fourth Sunday of Easter and Confirmation, is our two hundred and fifty ninth!! podcast to be posted. The homily is given by Monsignor Curtis Mallet. This weekend, we will continue our Easter celebration of the Sacraments of Initiation when our Confirmation candidates are confirmed at the 5pm Mass today. Msgr. Curtis Mallet will be the celebrant at the Mass and will administer the sacrament. With grateful hearts we welcome him to our parish for this celebration. The Confirmation class has been preparing since January for the reception of the sacrament, and we celebrate with joy their new status as fully initiated Catholics. We pray that they will cooperate with the graces received in the sacrament and will live Christian lives in imitation of Jesus as taught by His Church. Please remember the candidates in your individual prayer. Thanks for a job well done to Deacon Joubert, who led the formation program for our candidates, and to Mrs. Lois Joubert, who administratively coordinated the program. We also want to thank the class itself for their service project to the parish. They painted the retaining wall on the west side of the parking lot as well as the bottom of the church building. The project has made the decorum of our church building more consistent with the architecture and appointments of our grounds, and they did a very good job on the project! Many words of appreciation have come from our community for the job well done. On another note, this week 37 pilgrims, including myself and many of our parishioners, will be leaving for France on a pilgrimage. We will be touring areas where many of the images in our church building originated, including the tomb of our patron, St. Landry, located in Paris. Know that you will be in my prayers, and please be sure to keep the pilgrims in yours! The bulletin for the week of April 21, 2013 has been posted. Click here to see it. The current week's homily is available on a link on the front page of the website next to the link for the current week's bulletin. On the page with the prior bulletins, the corresponding homily will be sitting side by side with its bulletin. We started on the anniversary of the start of the Catholic Church, Pentecost Sunday --- nearly four years ago. This week, the Third Sunday of Easter, is our two hundred and fifty eighth! podcast to be posted. The homily is given by Father James Brady. This weekend we continue to celebrate the Easter season with our annual parish picnic. 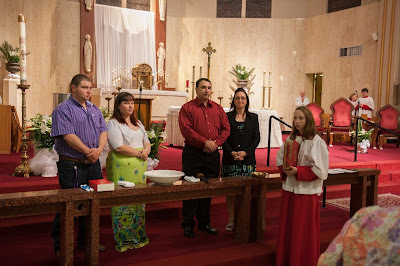 Last weekend we celebrated First Communion with our young children. Next weekend, we will celebrate Confirmation with our young adults at the 5pm Sunday Mass. My hope is that all of us will continue to celebrate and enjoy the Easter Season, as it continues until Pentecost Sunday. We seem to do well in recognizing and responding to the season of Lent and having a spirit of prayer, almsgiving and fasting during the 40 days. Now is the time (and for the next 50 days) to recognize and experience The Risen Christ with great joy because of His Resurrection and the promise of eternal life that it brings. 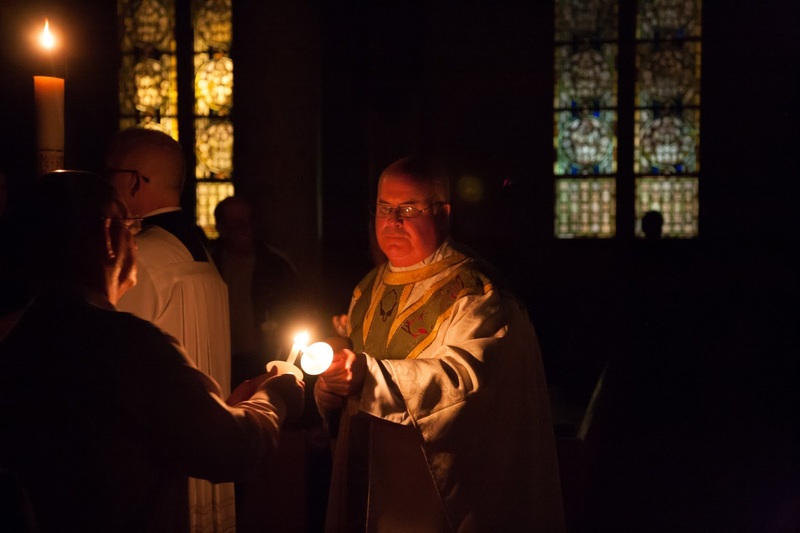 We hope you are able to come and enjoy good food and good company this weekend, and please be sure to keep those who have received and will receive Easter Sacraments in your prayers. The bulletin for the week of April 14, 2013 has been posted. Click here to see it. The current week's homily is available on a link on the front page of the website next to the link for the current week's bulletin. On the page with the prior bulletins, the corresponding homily will be sitting side by side with its bulletin. We started on the anniversary of the start of the Catholic Church, Pentecost Sunday --- nearly four years ago. This week, the Second Sunday of Easter, is our two hundred and fifty seventh! podcast to be posted. The homily is given by Father James Brady. This Sunday is Divine Mercy Sunday, marking the end of the Easter Octave. The Easter Octave is the eight day celebration of Easter from Easter Sunday until Divine Mercy Sunday. We continue the Easter season until Pentecost Sunday in May. Looking back over the last couple of months, we have so much to be thankful for as a church parish, especially to those who made our Lent and Easter so beautiful and spiritually meaningful. We are blessed to have Msgr. Melancon living in our parish. He took on extra duties during Lent here at St. Landry and at Opelousas Catholic, helping to lead both us and our children through Lent. We are also blessed with three deacons, Deacon Diesi, Deacon Joubert and Deacon Miller, who also did the same joyfully and without reservation. Our parish staff, both office and maintenance, also did an outstanding job in cheerfully handling the extra work that always come during this time of year. If you have the opportunity, please express your appreciation to them. However, without the support of so many of you, the celebration of Lent and Easter would not have been as beautiful and meaningful as it was. It began with Ash Wednesday and our Altar Society appropriately decorating our church. Many worked long hours to provide our new statue covers for passiontide (both violet and red) and new appointments for Easter (white altar covers and a cover for the crucifix). The Altar Society worked throughout Lent and Easter to make our church look more beautiful for our spiritual benefit. A generous parishioner provided the "Little Black Books" which so many of us found spiritually fruitful in preparing for Easter, and our Parish Advisory Board sponsored a "soup and bread" dinner after Stations of the Cross on Fridays. Our choir and music ministers did an outstanding job during the seasons, but especially during passiontide and the Easter Triduum. Our sacristans, altar servers, readers, and extraordinary ministers of Holy Communion served reverently and competently. Our blog was most informative about the meaning of the seasons and what was going on in our church parish. Some cut palms for Palm Sunday, while others cultivated our gardens around the church. Our suppliers ably and competently provided things we needed (obviously, we thank Jim Durio Florist for the beautiful flowers, but we also had a sound system problem and an air conditioner motor breakdown during Holy Week! These things were immediately repaired by Phil Borel and Wayne Bergeron, respectively, in time for the Easter Triduum). So many people helped in so many ways. We thank and appreciate all of you! I also want to thank all of you who participated in our liturgies and activities during Lent and Easter. It is usual during Lent that attendance at daily Mass and Stations of the Cross increase, especially at the beginning of the season. After a few weeks, however, attendance usually shrinks a bit. This year, not only did attendance not shrink, but it generally increased over the season! Our confessional was busy, enough so that we many times had to hear confessions both before and after our daily Mass! These things indicate a healthy spiritual life within our parish and a living out of the Lent and Easter seasons within our hearts. It also encourages others by example and solidarity in our faith. This is most important to our community, and make for a most joyful Easter in the most important way, in our hearts and souls! Thanks again to all! May God Bless you during the Easter Season, Alleluia, Alleluia!! God Bless! The bulletin for the week of April 07, 2013 has been posted. Click here to see it. 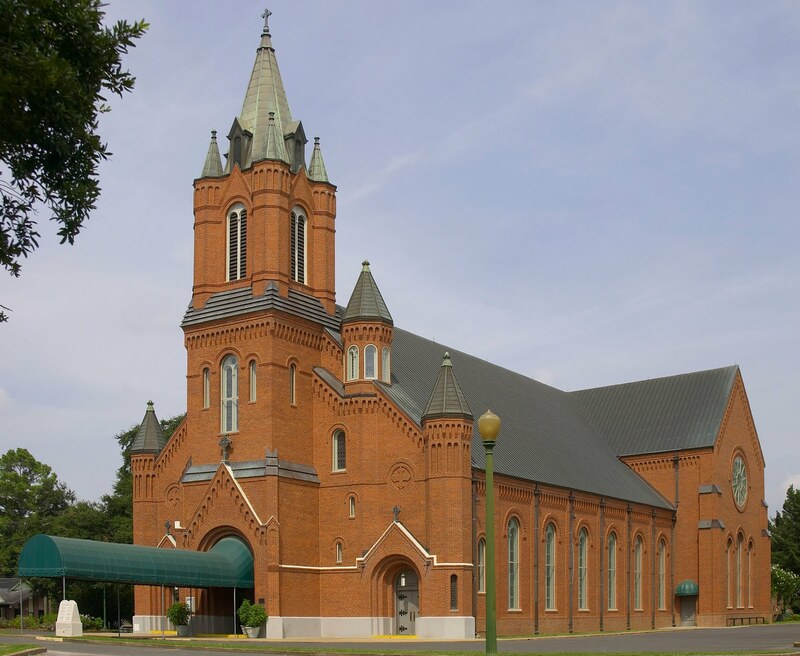 Today is the 104th anniversary of the first mass at St. Landry Catholic Church in Opelousas, Louisiana! In 1900 a temporary church was completed. In 1902 the task of removing and clearing away the old church was started. In 1903 the foundation was formed with concrete and brick from the old church. On August 8, 1908 the cornerstone was laid. During the winter of 1908-1909 construction of the walls continued and was completed and occupied. On April 2, 1909, the first Friday of April and 104 years ago today, the first mass was said in the current St. Landry Catholic Church. The interior of the church was not completed. Father John Engberink was our pastor who built the church. Father Engberink is buried in the floor of the church near the sanctuary. Monsignor Albert Benedict Colliard followed Father Engberink as Pastor. Monsignor Colliard completed the interior. Monsignor Colliard is buried in St. Landry Cemetery near the cross. Monsignor Broussard was the pastor following Monsignor Colliard. Monsignor Broussard in 1963 had the interior of the church redecorated and air conditioned. Photos from the Easter Vigil are now up on Flickr.